Having a baby and want to know if your hospital is particularly C-section happy? Yelp aims to make that process a bit easier with the addition of a new maternity care rate feature. To do that, Yelp worked with state and non-profit organizations California Health Care Foundation (CHCF) and Cal Hospital Compare to get the California stats. Both of these organizations pull from self-reported hospital statistics on the number of C-sections performed, breastfeeding success rates, episiotomies, vaginal births after C-sections (VBACs), and if VBACs are made available at that hospital. One in eight babies born in the US are born in the Golden state, where C-section rates for low-risk mothers vary from 10 percent to 70 percent, depending on the hospital. By offering this information, Yelp spokesperson Shannon Eis, who had to go through a possibly unnecessary emergency C-section herself, told TechCrunch the hope is for more transparency in the process. 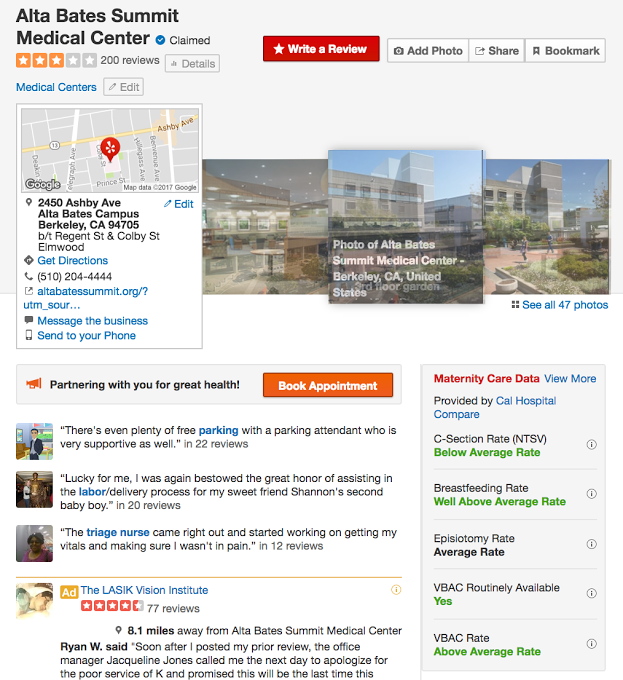 The new feature works by going onto Yelp and then searching for one of the hospitals in the state that include maternity care. Once that hospital comes up, you’ll be able to see the Maternity Care Data section on the right-hand side, next to user comments. From there you can check out if that hospital has a well-above, above, below, well-below or average rate of care. The rollout is part of a consumer protection initiative between Yelp and ProPublica aiming to bring better medical information to the search site. So far, Yelp has rolled out a feature rating restaurant health scores and introduced ratings for 4,600 hospitals, 15,000 nursing homes, and 6,300 dialysis clinics throughout the U.S. The new feature is only available in 250 California hospitals (the number of hospitals in the state that offer maternity care) for now, but Yelp says it plans to roll out to other states as it continues to work with governments and non-profits to provide the data.